With twelve #1 pop singles, numerous gold recordings, sold-out concerts, and regular television appearances, the Supremes were not only the most commercially successful female group of the Sixties, but the top selling female group of all time. Diana Ross, Mary Wilson, and Flo Ballard were The Supremes, and, Linda Miller and her trio perform hits like “Baby Love”, “Where Did Our Love Go”, “Stop in the Name of Love”, “I Hear a Symphony” and all of the group’s greatest hits to perfection. 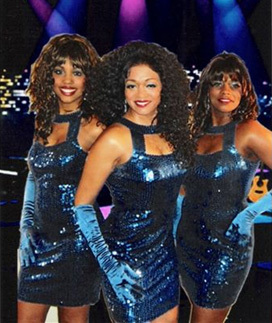 You won’t believe your eyes and ears when this fabulous group of females brings back the Motown memories with the Tribute to the Supremes!